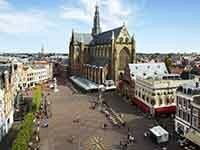 A small, very cozy and incredibly atmospheric - the city of Haarlem. It is located only 20 kilometers from Amsterdam. Here you can safely enjoy all the Dutch beauty, take a walk through the ancient streets and, of course, go shopping.